Happy new year! There's nothing like starting the new year off with a new project and that's what I'm doing! 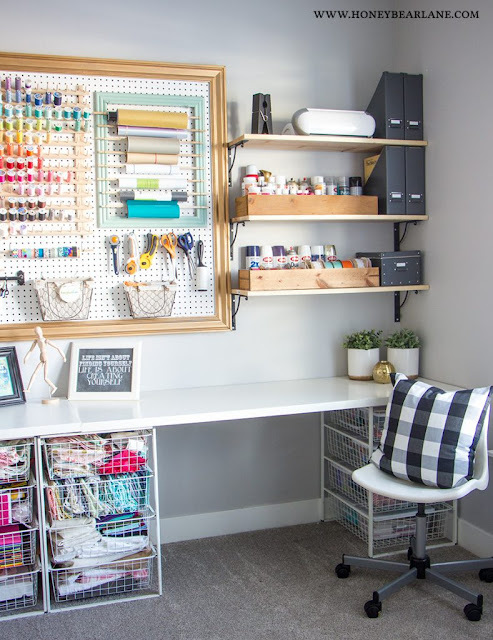 I'm joining with lots of other home bloggers for the $100 Room Challenge, organized by Erin and Lemons, Lavender, & Laundry and giving my design studio a fresh new look. 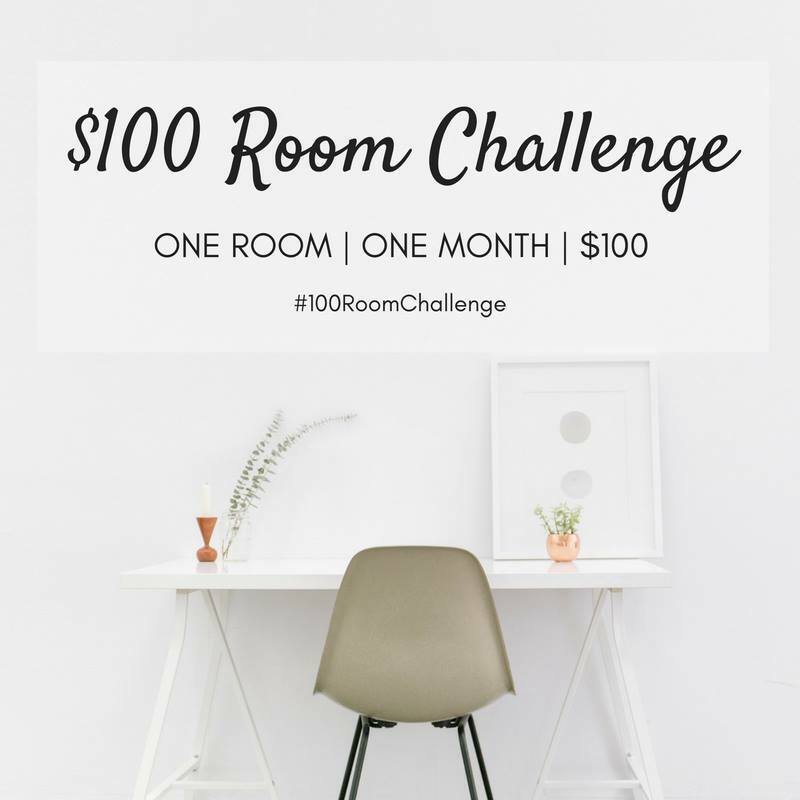 As part of the challenge, no more than $100 can be spent on the room. Progress updates will be posted here each Wednesday this month with the reveal in 4 weeks. Stay tuned for tutorials and updates. 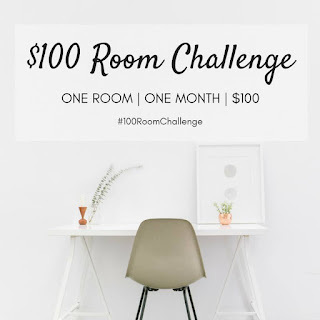 If you're visiting from the $100 room challenge and are new here, WELCOME! You can get to know me a little better HERE. And you can take a quick tour of our home HERE. Be sure to scroll to the bottom of the post and see all the rooms that are getting low budget makeovers! 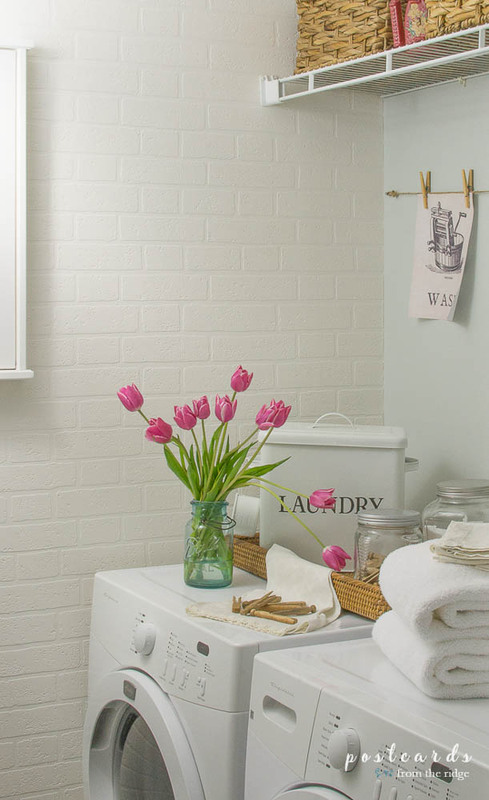 Last year I gave our laundry room a makeover as part of the $100 room challenge. You can see all the details HERE. One of my goals this year is to create more. 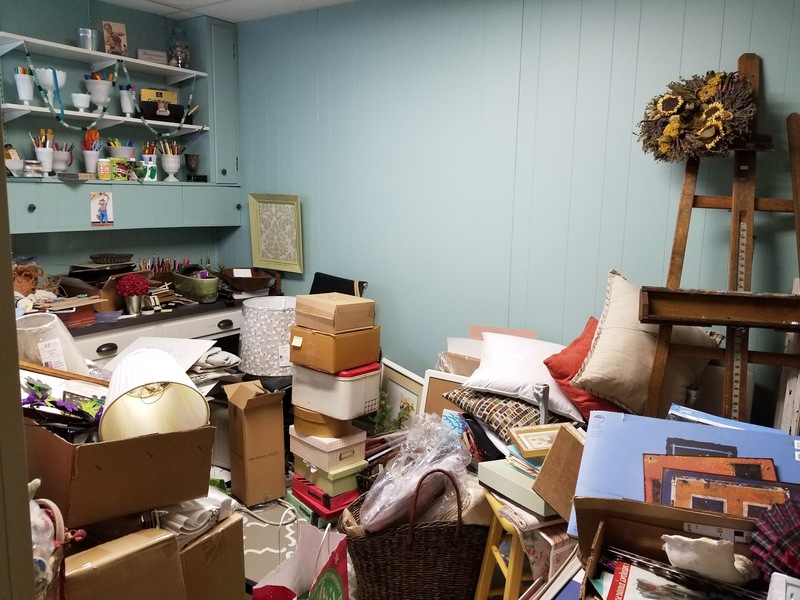 My basement office/craft room has been neglected and has become more of a storage room than anything. If I could even get in here, I wouldn't feel very inspired to create. Here's the embarrassing, ugly truth of how it looks right now. Piled high with supplies and shop items, and totally depressing. Please don't judge. To say that it has become a dumping room is an understatement! But it has good bones, plenty of storage and space, and is definitely being underutilized. So it's time to clear the crap out of here and make the best use of it. Since my office is currently housed in our family room, this room will become a dedicated design studio. I got a new Cricut machine and supplies for Christmas and want to get it set up in the design studio so I can start making cool things with it. My plan is to create some unique pillows and artwork. Some of them will be offered for sale in my online shop, Emory Valley Mercantile. This is one of my all-time favorite work spaces. It has storage, style and space to create. 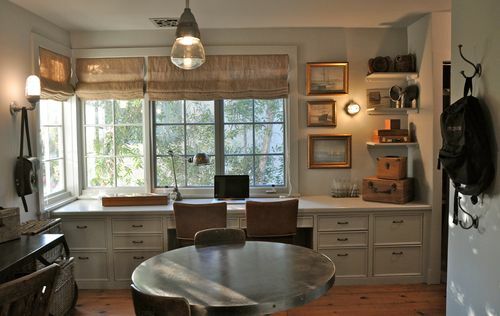 This is a great space and I hope to have a similar look when I'm done. I already have some of the wire storage drawers and will be using them for fabric scraps. A small table would add some much needed workspace. 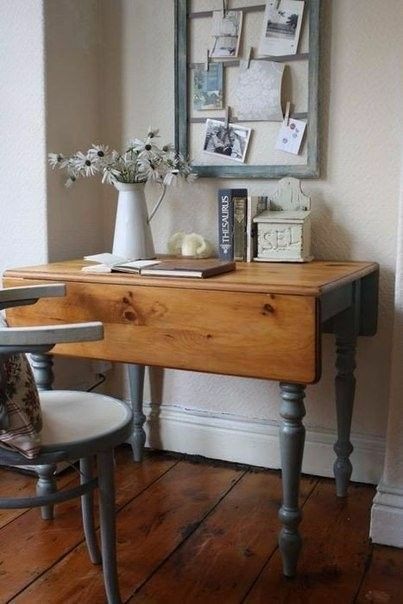 I have one very similar to this with the drop leafs and will probably add it into the room. 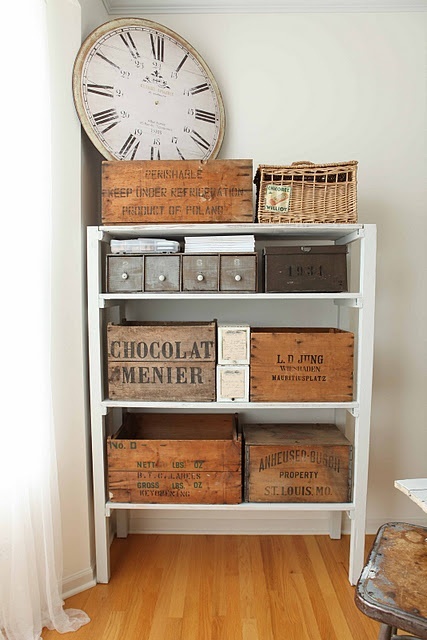 Old wooden crates make great storage. I have several and will be using them in the space. 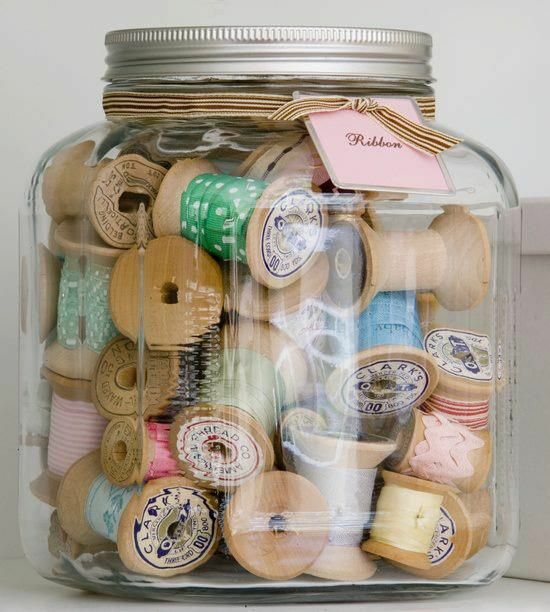 I have lots of ribbons, spools, and fabric scraps and want to store them like this. 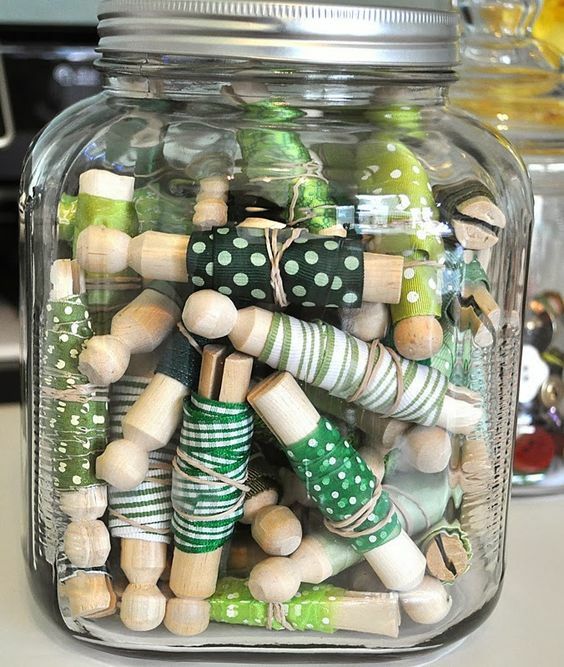 I already have some clothes pins and jars so this idea won't cost me anything. 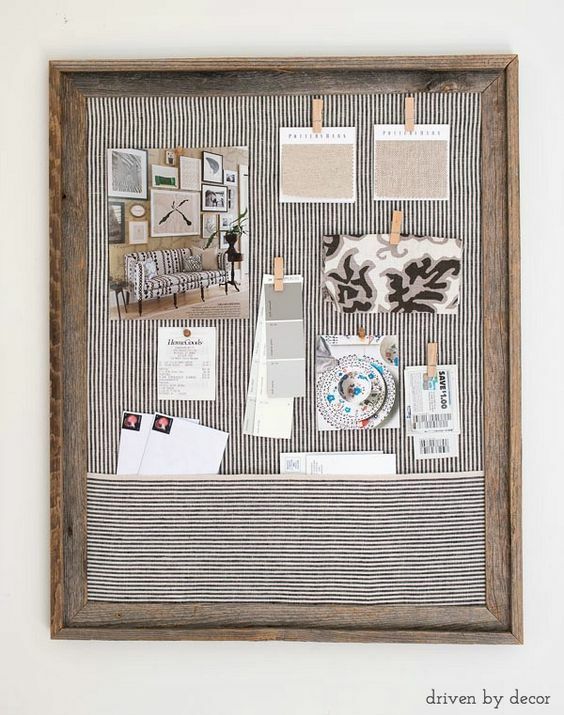 An inspiration board is a must. I love this idea from Driven by Decor. I already have a couple of unused bulletin boards and some scrap fabric. This will be a another freebie project. 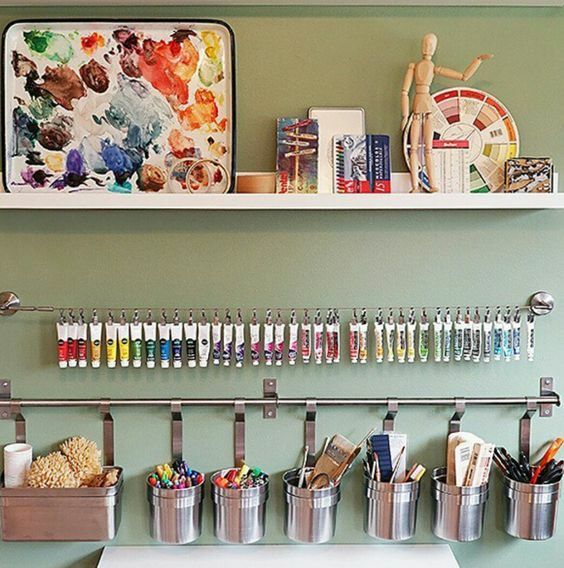 Wall storage and organization is something this room really needs. I love the look of this and will have something similar. Whew! That's a lot to do in a few short weeks! I guess I better get busy! Have you made any plans to redo a room this year? Leave me a comment below and let me know about it! Goodness! I have a room that looks just like that - except there is a path to the ironing board. Good luck with your make-over, I know it will look amazing at the end. Oh how fun! (Why is it that our offices always become the family dumping ground?) I love your design plan and can't wait to see it come together! 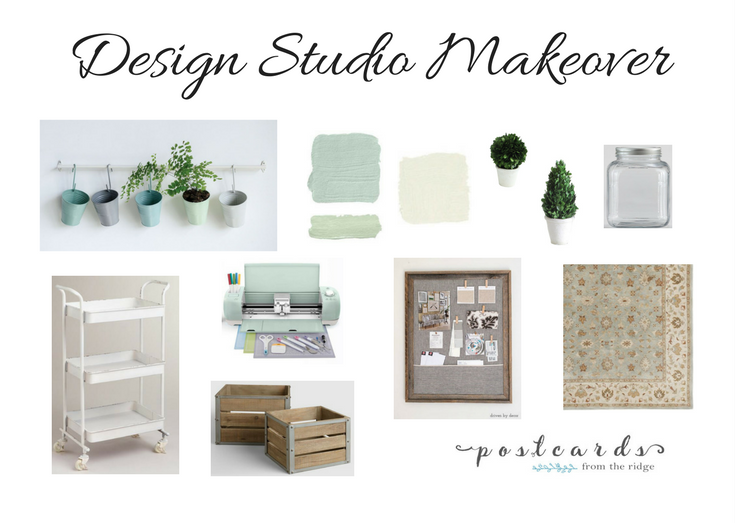 Love your mood board! Your room is going to be lovely! How exciting, we've seen the others you have accomplished, so know it will be a great one. How exciting to be getting a new room! My room looks way worse than yours does and it still has the baby border from when it was my son's room.....almost 20 years ago! 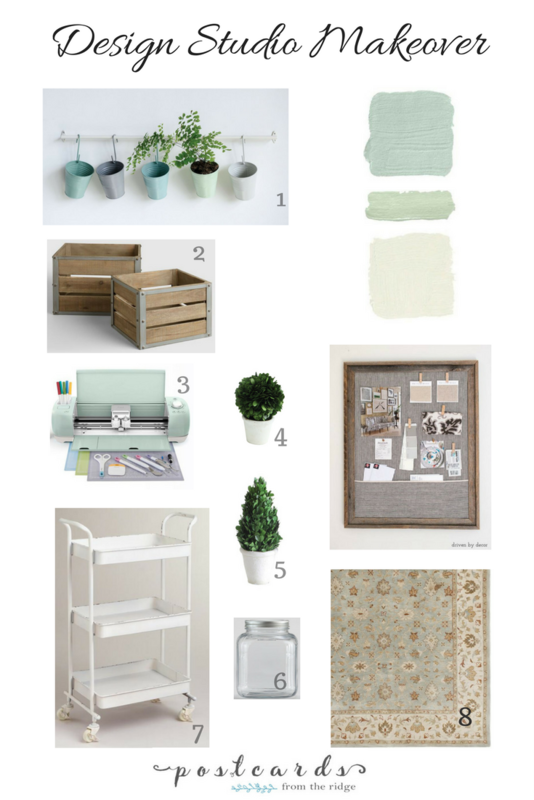 I love some of the ideas you found to incorporate in your new room. Looking forward to the reveal! Does designing a room from scratch count? My husband just finished closing in part of our barn for my art studio. I have a blank slate. I need to sit down and plan it out! I'm working on a home office/craft room too. My before pic was just as bad so I can relate. I am impress and inspired by all your inspiration ideas. Looking forward to seeing the end result. I bet this is going to look amazing and feel so functional too! Can't wait to see how it turns out. Love your ideas for making over your craft room! I think we all have spaces like your before pic that need organizing. I know I sure do, and it has inspired me to get busy organizing. Like the colors you have chosen. So serene. I love, love, LOVE the look of your plan. Seriously every part makes me so excited! Can't wait to see it come to life.